Obviously I spend way too long on the net, I get completely bogged down in Wikipedia. Link after link and I just keep going like the energiser bunny. So here's one I found. We don't even get squirrels in Australia, land of the marsupial., so squirrels fall under the especially cute category. According to wildlife experts the odds against a pure white squirrel being born are one in 100,000. With a grey squirrel population of over 2.5 million in the UK, in theory this would mean that there are only 25 white ones out there at any one time. So it may come as something of a surprise to learn that so many of those little albino creatures have chosen to live in Surrey. But if the figures are to be believed, that is exactly what they are doing! Squirrels, white or otherwise, do not make good pets and under the Wildlife and Countryside Act 1981 it is illegal to release grey squirrels or to allow them to escape into the wild once caught. In fact, I'm so potty about our flora and fauna that I'm the sort of person who can get over-excited on finding an acorn or a nice shiny conker. I'll leap unexpectedly into the undergrowth on our weekend walks, only to emerge like David Bellamy (but without the beard) clutching something wriggling or slimy, or both. Occasionally I'll return with a fabulously interesting twig or something similar to show my husband, who will roll his eyes heavenward and wonder how long before he can escape to the pub. So you can imagine my excitement, when back in 2003, I reported on the story of Persil, the baby albino squirrel accidentally knocked out of a Surrey tree by two boys playing football. He and his grey brother Daz were taken to London Wildcare Centre in Wallington, where they spent the rest of their days being looked after by Ted Burden and his team. Persil was lucky. Like all albinos, he did not see or hear as well as other squirrels. This, coupled with the fact he stood out from the crowd like a furry Belisha beacon, could have made him an easy target for a predator to catch and kill. The Dorking squirrel, affectionately known as either Percy, Albi or Snowy depending on your point of view, was not so lucky. Having lived a happy, and possibly charmed life, in St Martin's Churchyard in Dorking for the last few years, he was killed in a road accident in October. Sad though it is, his life and death, both widely covered in the national press, highlighted the fact that Surrey still has more than its fair share of albino squirrels. 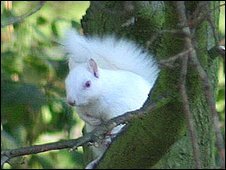 In 2003, as Persil's story broke, the figure given by wildlife experts alleged that one in every 100,000 squirrels born in the UK was an albino. Even allowing for a gradual rise in the grey squirrel population of 2.5 million, it still suggests that pure white squirrels in the UK are as rare as hens' teeth. But in the last six years, we have been sent many photos and stories from residents, telling us about the local albino squirrels living in Surrey's parks, churchyards and back gardens. This week, Ivor Paetow really threw a spanner in the "squirrel works" by sending in some pictures, of not one but three white squirrels in his garden at Great Bookham. You can view them here . 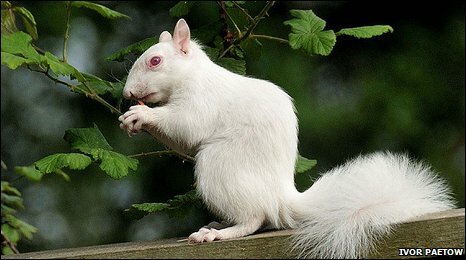 Nicknamed The Three Albinos by Ivor and his family, the little group proves another white squirrel fact. Rare they may be, but they often live in small albino colonies, so if you see one, the chances are there are others nearby. But with Ivor's drey playing host to at least three of them, it means there are only 22 other albino bushy-tailed critters at large in the UK's treetops. And your reports from across the county suggest this is either, not the case, or they all live here in Surrey! So in conclusion, it seems there are far more albino squirrels out there than the official figures would have us believe. Or maybe, as I first suggested in 2003, there really is something in the Surrey water!